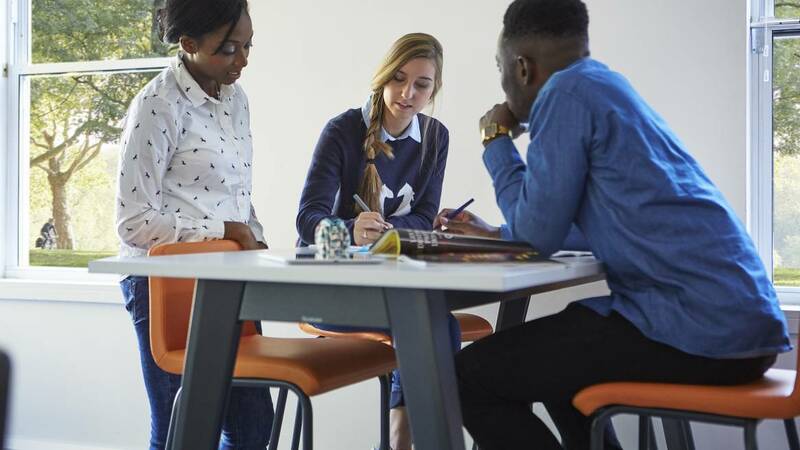 Steelcase Education researchers explore evolving definitions of student success, along with innovative strategies and new metrics. 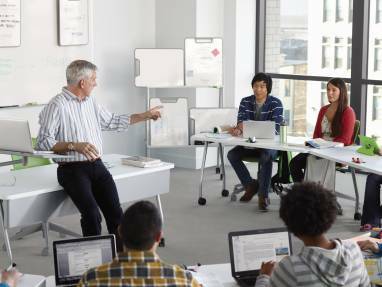 Steelcase Education is focused on helping schools, colleges and universities create the most effective, rewarding and inspiring active learning environments to meet the evolving needs of students and educators. 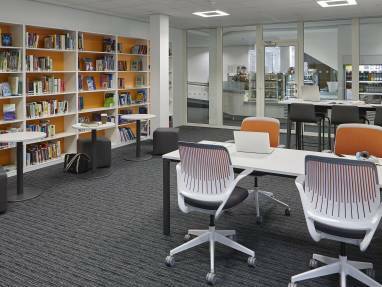 Using an insight-led approach, we design solutions for the many spaces learning happens, from classrooms and libraries to in-between spaces and cafes. 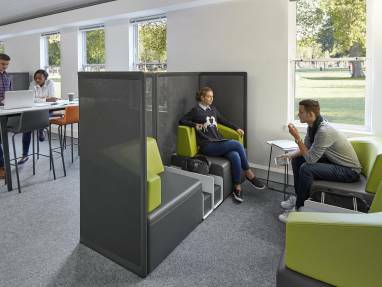 We have a passion for understanding how learning best takes place and how smarter, active learning spaces can help. 360 Magazine: Class, Can I Have Your Attention? 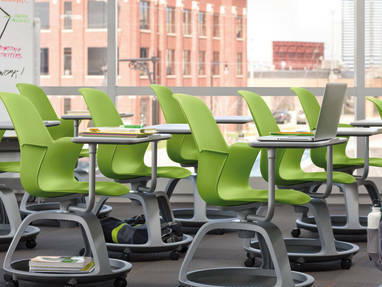 The Node school chair is mobile and flexible. It’s designed for quick, easy transitions from one teaching mode to the next. With Node, a classroom can transition from lecture mode to team mode and back again, without interruption. TalkTime is a flexible, stackable table. The legs can easily be flipped. 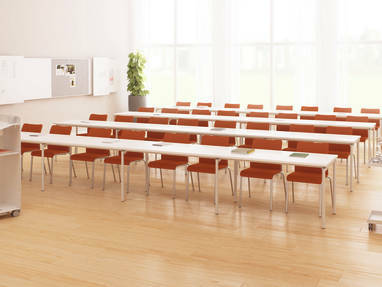 It is perfect for meeting or training rooms which need to be regularly reconfigured. It is highly robust and stable. Our Insights and Applications Guide provides the latest thinking on classroom design and learning spaces. 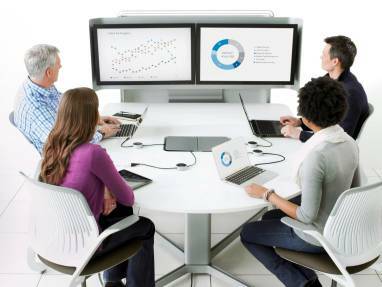 We rethink “the box” and move away from the traditional setting of rows of fixed tablet chairs and a lectern. Every space is a learning space. 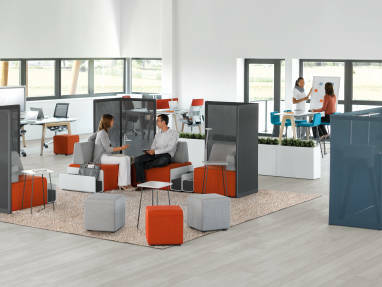 We reimagine how lounges, hallways and other informal areas can be flexible, friendly learning spaces for individuals and groups. media:scape LearnLab removes the barriers to sharing information and democratizes how people access and share information. The LearnLab allows students to contribute ideas quickly and seamlessly, while the unique design removes the front of the room, allowing the instructor to teach from any location in the classroom. The triangulation of content supports multiple teaching and learning styles without disruption. LearnLab Design Design Story: Steelcase’s WorkSpace Futures team used a user-centered design process to develop the LearnLab classroom. 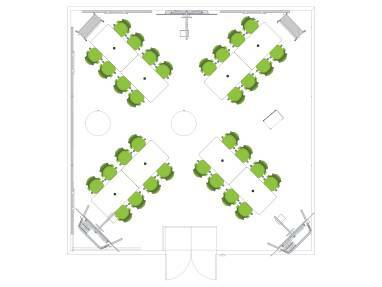 Students and instructors need spaces that support the ways they learn. Classrooms should enhance sightlines and interaction and support seamless transitions, collaboration and information persistence. 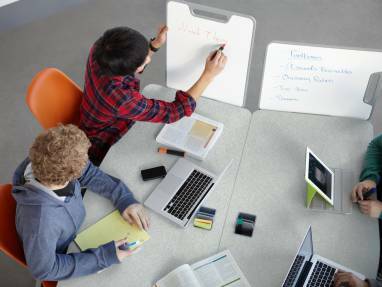 Verb is an integrated collection of instructor stations, student tables, personal whiteboards, display and work tools. Educators are often faced with a tough choice: promote active learning or fit as many students as possible into a classroom without much flexibility. Until now. The Node chair is mobile and flexible. It’s designed for quick transitions between room configurations. 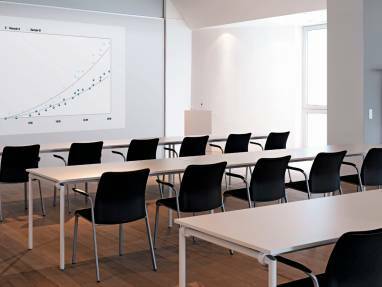 With Node, a classroom can flex from lecture mode to groups, and back again, without interruption. Node can take passive space and make it active, supporting active and team-based learning, even when student density is important.